Arizona isn’t the only place with a grand canyon. A few kilometers outside of Chiangmai, an old quarry with rust colored rocks has been converted into a large swimming area and water park, complete with Hollywood sign letters reading GRAND CANYON. We arrived on our scooter and opted to jump in fully clothed to beat the heat. Once upon a time in Montana, when I was much younger, I attempted cliff jumping off a 30-40 foot drop. It was my first experience leaping off any remarkable height beyond a diving board. Woefully, halfway down, I relaxed my posture from streamlined pencil to amorphous blob and my behind hit the water with a gigantic smack. The bruise lasted well over a month, turning from purple to blue to yellow as the blood slowly followed gravity’s path down the back of my thighs, its fantastic hues spreading out under my skin like an impossibly slow firework. The Grand Canyon has a similar jump and I’m happy to report that I completed it with limited injuries. Sure, it took me about four agonizing minutes to actually launch myself off the edge. Sure, everyone at the bottom was hollering at me to get over it and it would be fine. Sure, I didn’t quite maintain a straight pencil and settled for The Leaning Tower of Pisa instead. I smacked my side a little, but recovered and might actually consider cliff jumping again in another ten years. Our clothes dried as we scooted back to Chiangmai for Tiffanie’s much-awaited bamboo tattoo appointment. The shop, CNX INK, is run by a vivacious young lady named Jasmine and her comparatively silent boyfriend. Nowadays, bamboo tattooing is practiced by only monks or convicts. Interestingly enough, until a few years ago, monks couldn’t be prosecuted in a court of law, and if a man committed a particularly heinous crime, joining a monastery was a surefire way to avoid the consequences. Since practicing monks aren’t allowed to tattoo women, we had to go with a convict and, according to Jasmine, they’re more skilled anyway thanks to years of practice in the joint. In fact, particularity good bamboo tattoo artists have more lucrative prospects behind bars, given that a large majority of their clients are behind bars as well. 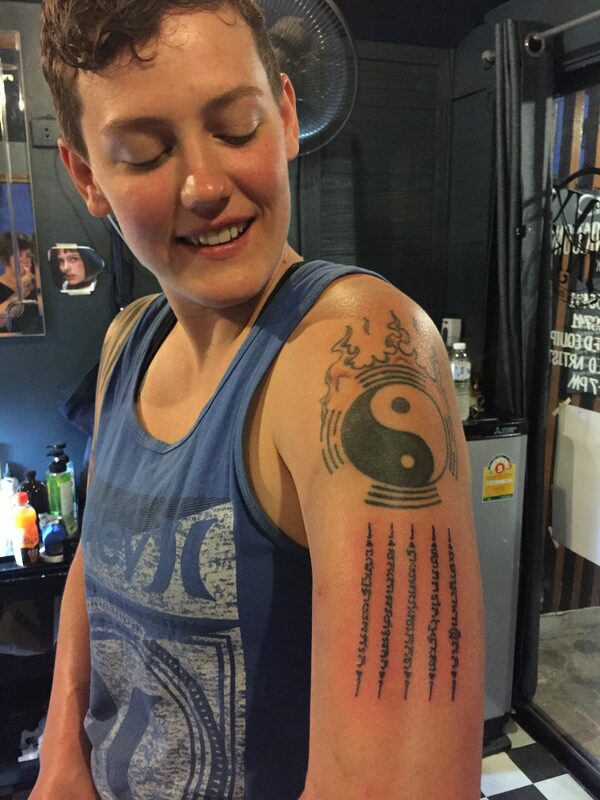 After three hours of chatting, poking and laughing, Tiffanie’s left arm looked much more interesting with the addition of a five-column sank yat and touch-up on her first tattoo. We wrapped up our day at The Yellow Bar, joining Jasmine’s friends for a few drinks. Our day starts early tomorrow with a minivan ride to Pai.